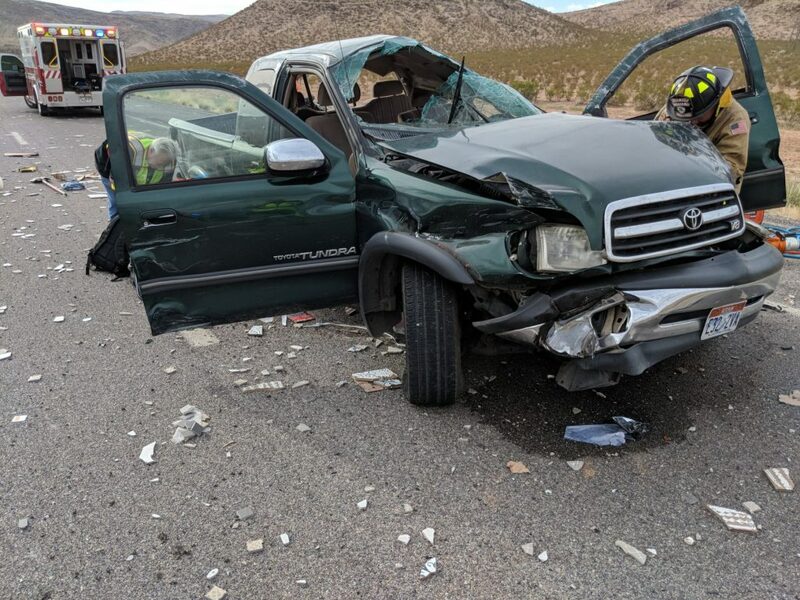 MOHAVE COUNTY, Ariz. — A driver was hospitalized Monday evening after he overcorrected and rolled his truck on Interstate 15 just south of the Utah-Arizona border. 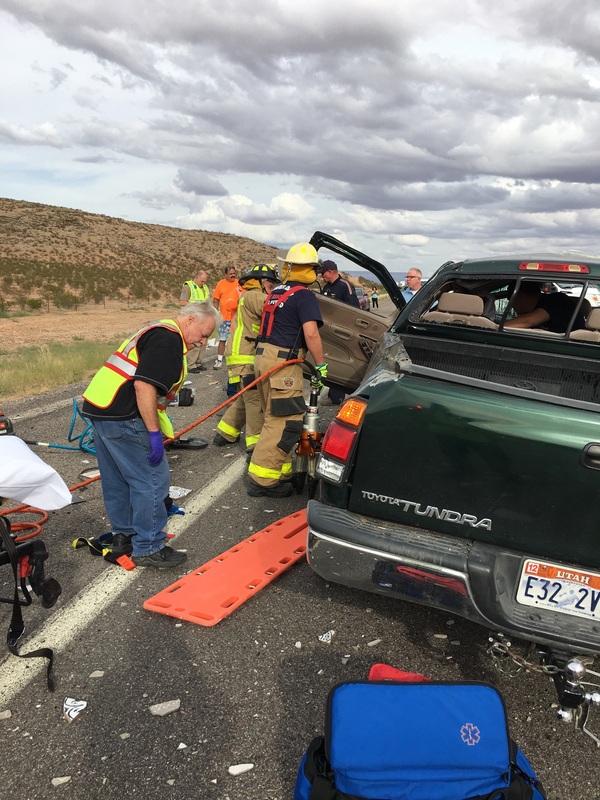 Emergency personnel responded to the crash involving a green Toyota Tundra pickup truck hauling a flatbed trailer a short distance south of Exit 27 on southbound I-15 in Arizona at 4:37 p.m. 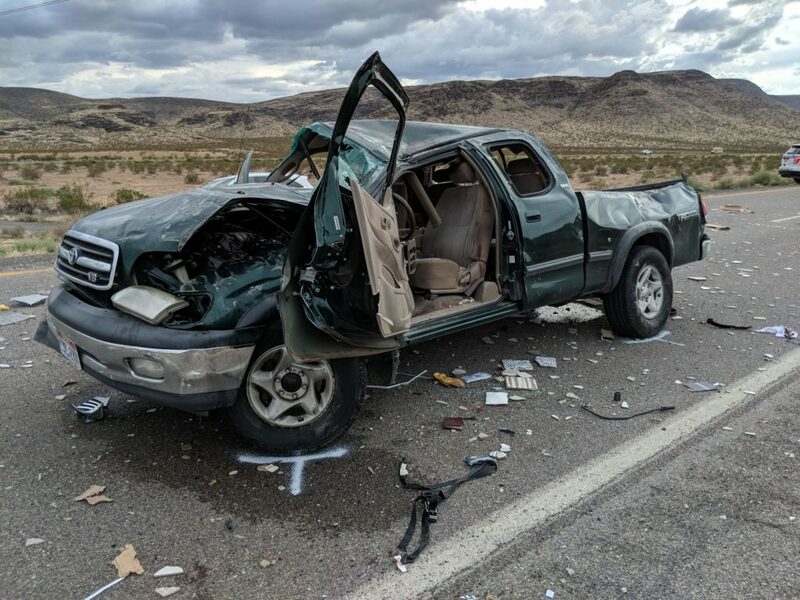 According to a witness, just before the crash, the truck was in the outside lane and appeared to start weaving back and forth as if the driver was losing control, Arizona Department of Public Safety trooper John Rogers said. As the truck was weaving, the trailer left the road, hitting the soft shoulder and causing the driver to overcorrect to the right, Rogers said. During the overcorrection, the truck hit a semitractor-trailer in the other lane, and the impact caused the truck to roll. The trailer broke away and went off the road to the right, while the truck came to rest upright in the road. 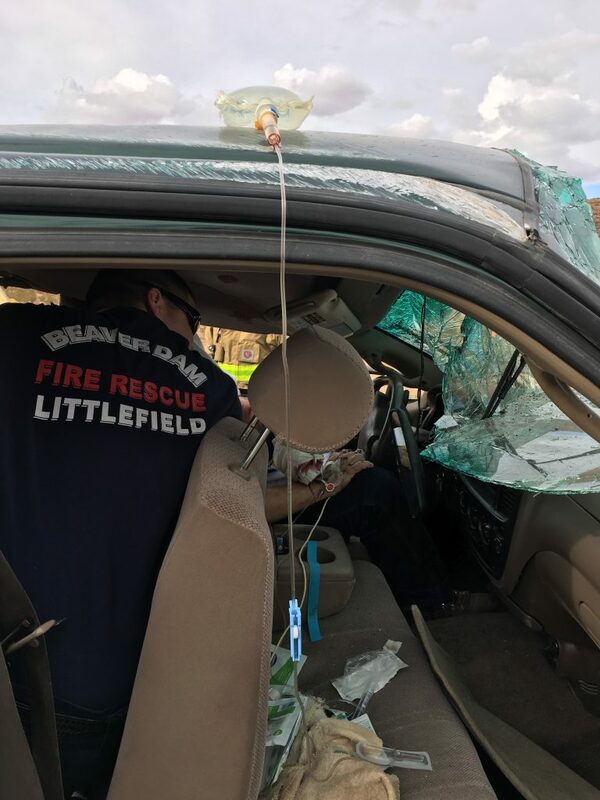 Responding emergency personnel from Beaver Dam/Littlefield Fire and Rescue extricated the man from the truck. The driver suffered significant injuries, Rogers said, noting that he was wearing a seat belt at the time of the crash. He suffered severe trauma to his head and hand but was alert and talking when medical personnel arrived. 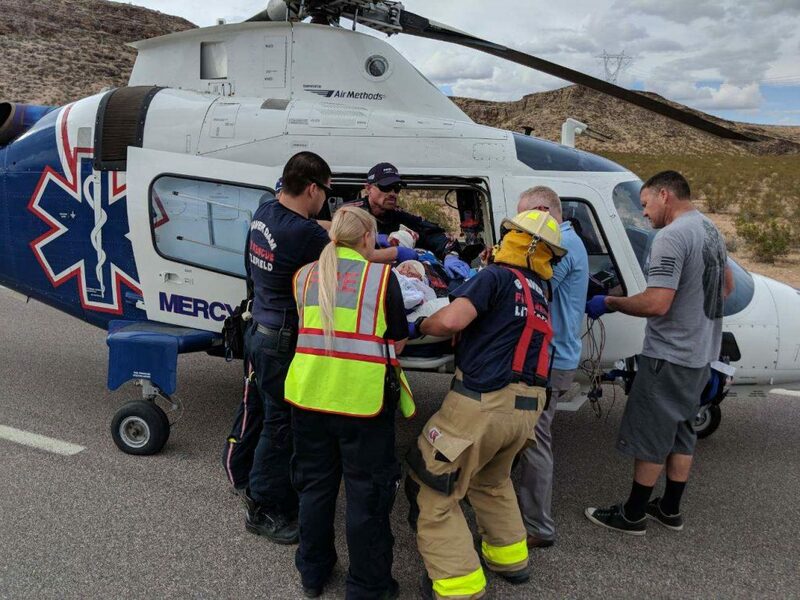 Given the critical nature of his injuries, a helicopter crew from Mercy Air responded and flew the man to Dixie Regional Medical Center in St. George. 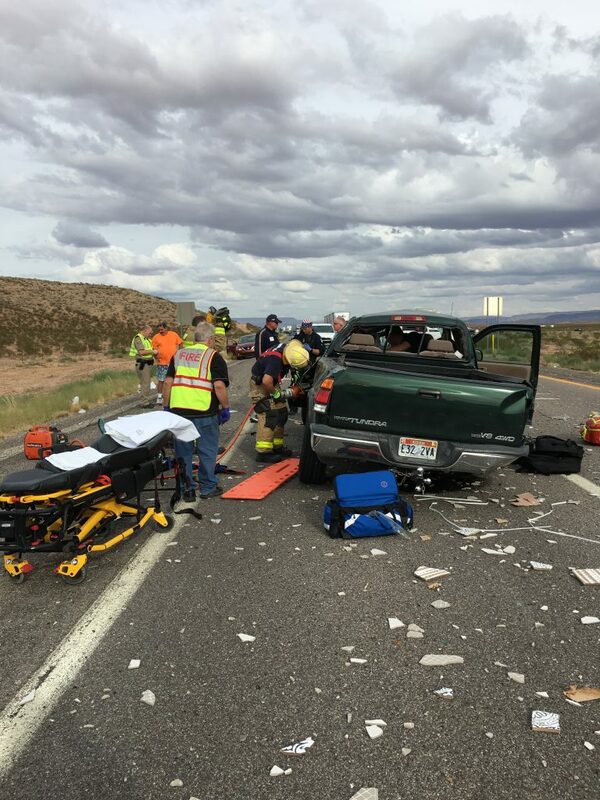 After the crash, the truck was blocking the roadway, prompting emergency personnel to close both southbound lanes while the helicopter landed and responders tended to the scene. The lane closures caused traffic to become backed up behind the crash for miles. Traffic was at a standstill for approximately an hour before one lane was opened, allowing the congestion to slowly clear as drivers trickled through the area. Details of the crash are still under investigation, but Rogers said impairment doesn’t appear to be a factor. “I believe he just lost control,” Rogers said. 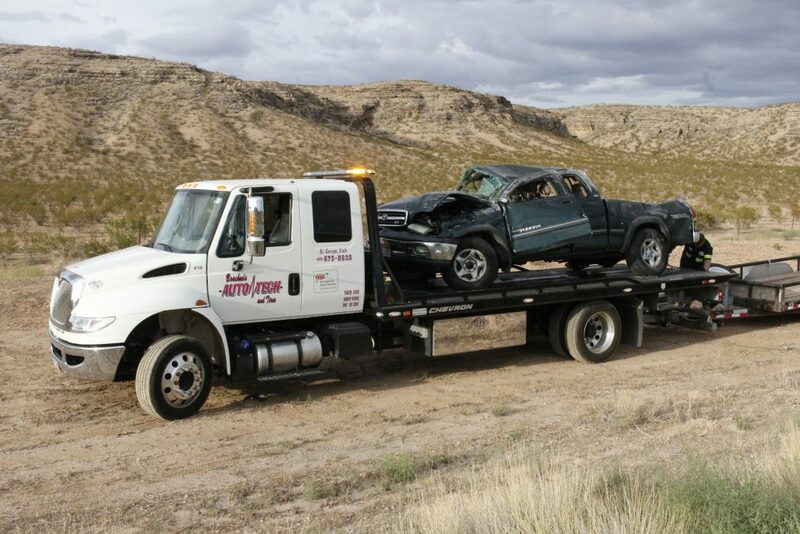 The Toyota sustained heavy damage in the crash and was towed away along with its detached trailer by a wrecker from St. George-based Bracken’s Auto Tech and Tow. The first responders at the scene came from an array of agencies, including the Arizona Department of Public Safety, Beaver Dam/Littlefield Fire and Rescue, Mercy Air, the Arizona Department of Transportation and the Utah Department of Transportation. This was horrible. I am curious as to hear what the investigative team determines his speed to be. My wife and I were passed by this truck and trailer just prior to the accident. As I was between 75-80mph this truck had to be doing well over that. My wife noticed this truck because of how the trailer was bouncing around. Hopefully there is good news on his condition but be this a lesson to people to slow it down, especially when pulling something. Could have been a multi car and fatality situation as we were less than a minute behind this. So7nds like speed reading witnesses.. could also be drugs, not knowing the gorge maybe? But he had utah plates.. this is why I haven’t beeen in the gorge in 6-7 years…people haveto go slower when they pull something.. nice truck. Well it was nice..the gorge is only 55 mph and everyone goes over that.. This accident happened before the gorge. Like I said this truck blew by us from Hurricane at around 90mph.